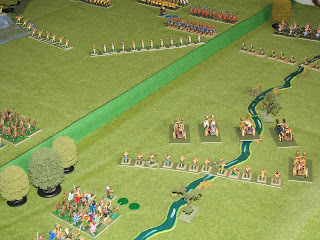 Celtic Chariots leading a hairy horde attack during a recent game that pitted invading Gauls against Greek citizen hoplites on Stephen Caddy's wargame table. Gaulish skirmishers are PBs "Southern Gauls", Gaulish warbands a mix of S range and PBs warriors. Greeks skirmshers are Garrison 20mm.